The most genuine moment of communal worship I’ve experienced was at a concert. 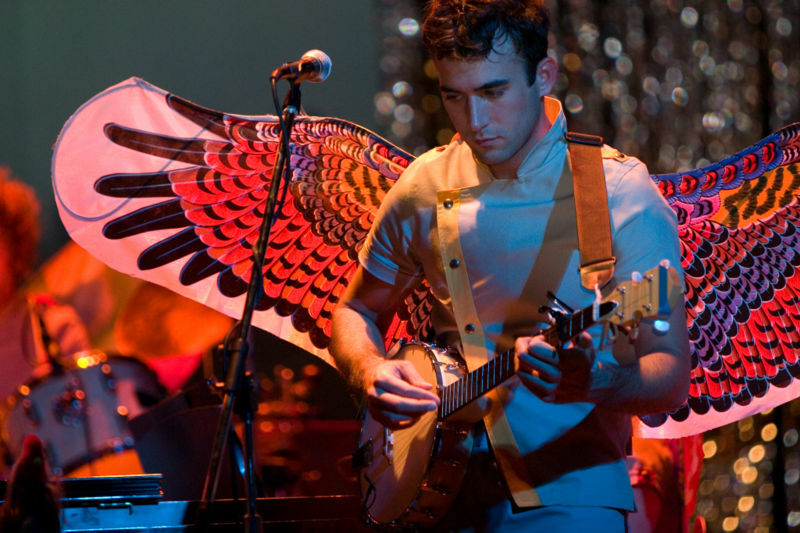 Singer/songwriter Sufjan Stevens was performing to a full house in Detroit and ended with his song Casimir Polaski Day. The piece is about the death of a girl with whom the narrator is in love. The final lines are heartbreaking in their blatant honesty: “All the glory when He took our place/But He took my shoulders and He shook my face/and He takes and He takes and He takes.” As the hundreds present sang along, ending in barely above a whisper, there was a sense of solidarity, community, even worship. God is sometimes awful, and it feels like He takes endlessly, and yet here we are bound together by our human hurt, sharing in and singing of His presence. I craved more art forms and more honest art in aiding my relationship with God, and in joining my community in our covenantal relationship with one another and God. In contrast, many of the church services I’ve attended are full of smiling people. From the moment I walk in the door, I’m welcomed by a grinning greeter before a smiling volunteer hands me coffee and a program, then sit down to hear a pastor tell me how great love and grace and forgiveness are. The Church has become a center for certainty and belief, a place to feel better about human experience. We hide our doubt and avoid acknowledging the hardships of evil in our lives. The arts can teach the Church about honest engagement, and incorporation of arts into our practice can guide community into encompassing and embracing the range and depth of human experiences. There was a time when the arts, like present day liturgies, were full of idealism and beauty in perfection. Artists were once encouraged, as John Walford puts it, to “avoid addressing the brokenness of creation as we experience it.” Instead, they were to depict beauty in perfection, to conjure an imagined or lost ideal. Walford goes on to point out that “such works fail to engage the viewer because they are devoid of the substance and grit of life as we know it.” Art portraying idealized beauty is sentimental, and in the Church such art “cheapens, rather than deepens,” as John Witvliet states, the viewer’s relationship with God. Indeed, sentimental art in the Church is counter-productive in that it averts viewers from action, as well as from their own encounter of a genuine emotional experience with the world. Eventually, artists’ understanding of beauty moved from an ideal into one that is equated with truth. As Walford summarizes photographer Cindy Sherman’s understanding, standard beauty had become dismissive “as obvious, easy and boring.” Artists began to develop a mature aesthetic of beauty, characterized as broken and wounded. In this understanding, beauty incorporates the horrible, hurting, and disfigured as part of the art’s honest engagement of the world we inhabit. Herman argues that such an aesthetic is not only permissible but encouraged by the resurrected Christ. To Herman, the aesthetic of wounded beauty “bears the marks of Christ’s resurrected body — marks that memorialize suffering but move beyond it to redemption.” Just as Christ bears the marks of pain while simultaneously offering a hope that is beyond the present world, the challenge is for art to bear pain while offering an image of what could be. Art in liturgy is also a participation in the work of the Spirit. Begbie approaches the question of art in worship by looking at where we are headed as shown by the ending chapters of Revelation and by the Spirit’s work among the Church as portrayed in the New Testament. He writes of a Spirit who “exposes the depths” of both humanity’s forsakenness (exemplified of Christ’s cry on the cross) and the depths of God’s love for us (exemplified by the act of Christ on the cross). Artists participate with Jesus and the Spirit by avoiding sentimentality and delving into the depths of both human joy and sorrow. Another way that artists join the work of the Spirit is in the act of re-creation. Artists take existing materials and transform them into objects of beauty or curiosity: pieces that evoke a response from the viewer. Similarly, the Spirit took the existing person of Jesus and resurrected him. It was not a mere resuscitation, for the resurrected Christ was in some ways unidentifiable to his followers at first glance. The Spirit’s work was one of transformation, of taking a person and making him new. When artists take tired materials and create something compelling, they are participating in the redemptive and transformative work of the Spirit in our midst. This is the art of suffering, allowing art to ask the same difficult questions we ask of God that encompass not only hope and love, but also despair and tragedy. With broken or wounded beauty, art is a continuation of the work of transformation the Spirit began in resurrecting Christ, and the resurrected Christ can be found there. Just as Christ carried the memorializing marks of his crucifixion while offering hope for a new world, so art can expose the depths and range of human emotion while avoiding sentimentality. This piece was originally written for Theology of Spiritual Formation with Chelle Stearns. Students were asked to write on liturgy.